Suddenly realised I hadn't shared any progress on these and it would appear I've only taken this one picture so far, and they're almost complete. As much as I tried to convince myself these will speed movement up my last game suggests I might have been mistaken. Regardless I thought I'd make them match my Red Planet BASE! 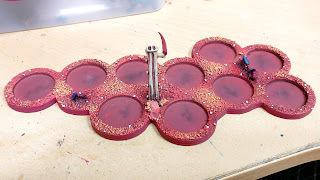 I'd added sand and a few Tyranid elements - Venom Cannons as small spore chimneys and some Spine Fists erupting from the ground as alien growths [what else would I use Spine Fists for?]. These were a a really neat way of making them look a little cooler and actually the Venom Cannons help with movement as I can move the entire tray by picking it up from the chimney. However, I have created a eminently difficult item to transport! Seriously these things are a nightmare and I envisage them snapping off at the first opportunity and being really annoying to go in boxes far bigger than they would have required if they'd just been flat! At least one of the 10 bases and the Tervigon/Trygon doesn't have the chimneys on, so they're less annoying. 'nids part 240 - Trygon - TO DONE! 'nids part 238 - Rippers - TO DONE! Deathwatch/wing - Librarianism To Done!